BBC NEWS | UK | Wales | Wales politics | A steadied ship or a missed boat? 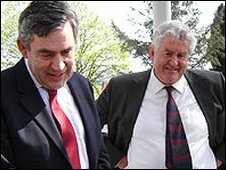 A man with huge intellect, a common touch and unique sense of humour, who shored up devolution and the Labour Party in Wales at a time when both were in crisis. Fellow politicians, political analysts and historians tend to agree with this view of Rhodri Morgan. But they part company somewhat on the question of whether he has made the most of opportunities available to him over nearly a decade in power. Richard Wyn Jones, director of Cardiff University's Wales Governance Centre, believes it was the manner of Mr Morgan's arrival in the top political job that was his making. In 1999, he was blocked from leading Labour in Wales by Tony Blair. However, Mr Blair's choice, Alun Michael, was forced to resign the following year. 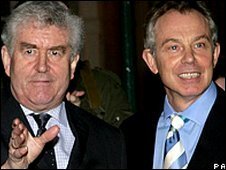 Becoming first secretary, as the job was then known, Rhodri Morgan was widely seen as the popular choice by not just the Labour membership but much of the population of Wales. "He was seen as our boy who was being put down by this posh bloke in Downing Street," observed Dr Jones. "I think, after that, it's almost as if Rhodri Morgan is above the normal rules of politics in Wales because he's 'our boy'. "Even if you don't want to vote for him, he's still seen as an important symbol, an important mascot for Wales and, in a sense, above reproach or criticism". Former Labour MEP Eluned Morgan said Mr Morgan was able to make the assembly "perhaps not loved by the people of Wales, but certainly accepted", after the narrow 1997 referendum victory which created the institution. "You needed somebody to have secure stability for a long period of time, and I think that's what Rhodri has done, more than anything. "He's really embedded the assembly into Welsh minds, Welsh culture and amongst the Welsh people, and without that continuity I think we could have been in trouble." Peter Stead, the historian, agrees that Mr Morgan's leadership was critical after Welsh devolution's difficult birth. "It would have been absolutely fatal if devolution had been dominated for the last decade by petty party scraps - if it had been minor politicians shouting at each other in the Senedd," he said. "Rhodri has gone out, it seems to me, and he's spoken to the academics, the intellectuals, the professionals, the business community in Wales and he's said devolution belongs to the whole of Wales, we must all work together, we must pool our expertise. "In that sense he's taken a lot of ideology, a lot of the anger, a lot of the rhetoric out of politics." 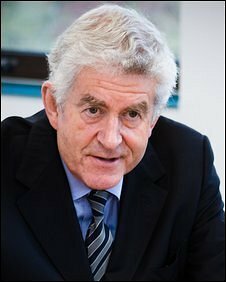 Historian and Labour Lord Kenneth O Morgan regards Rhodri Morgan as the "most effective first minister Labour could possibly have had". "I think being first minister of Wales is not easy," he said. "It's not a strong institution, its powers are limited, it has no financial powers. "There's a general sense that the culture of Welsh politics is, frankly, quite parochial and Rhodri has been able to transcend that". Believing history's judgement will be "very generous" on Mr Morgan as first minister, Richard Wyn Jones thinks he could have done more to change the Labour Party in Wales. "Despite all the political capital that he had, all the possibilities open to him to fundamentally change the party, he leaves a party which is in dire straits organisationally, which I think has got real problems in terms of its core message and is facing some of the most difficult elections in its history with really very few ideas about how to deal with the problems it faces," he said. 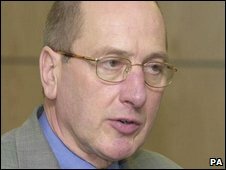 The man who defeated Mr Morgan in the first Welsh Labour leadership contest, in 1998, and was originally going to be first secretary for the assembly's inauguration was former Welsh Secretary Ron Davies. Mr Davies fell out with the party following an "error of judgement" with a stranger on London's Clapham Common and is now a cabinet member and independent councillor in Caerphilly. He has an alternative take on the "Rhodri steadied the devolution ship" argument. "You could say it is letting the civil servants get on with it. "My view is that, rather than having that period of quiet, bedding in, in a sense going back to the old status quo, letting the old systems take over, that was the time when we really should have been driving forward in a very new and vigorous way. "And that's when we should have been changing the culture of Wales, the political culture of Wales, the economy of Wales. "That's when we should have been using the once-in-a-lifetime - almost - legacy of Objective One (European) money to create a new economy in Wales, liberating local government, getting new partnerships in place between education and health authorities and so on." Former Plaid Cymru president Dafydd Wigley admires Mr Morgan's popularity, and the "vital credibility" he gave the assembly. But Mr Wigley also questions his leadership methods. "He has been prepared to allow his ministers to have a considerable amount of freedom, which is very good," said. "But there needs to be a coordination, and a vision, and a drive to achieve that vision. "I think that Rhodri Morgan has been willing, very often, to paint some of the long-term objectives there, but hasn't been involved sufficiently in the detailed road map as to how one reaches those objectives. "If one needed to split hairs, I think in the fullness of time, in a 10-year period when there was a reasonable amount of resource available, and certainly a clean sheet with regards to policy, an opportunity may have been missed. "But I wouldn't want that to undermine the positive things that he, undoubtedly, has given Wales." 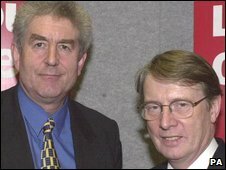 Alun Michael was the man who quit as first secretary in February 2000, before a no-confidence motion, making way for Mr Morgan. Mr Michael, the Cardiff South and Penarth MP, agrees, with good grace, that his successor was better suited to the role once the fledgling institution was open for business. "I think, in terms of the transition - setting up the assembly, setting its systems in place, challenging officials about some of assumptions they'd made and actually getting to grips [with] some of the things like the enormous black hole in the finances which we inherited when I took over as secretary of state for Wales... those were things that probably I was best suited to do. "But, of course, very quickly into the life of the assembly you had the 60 members, the challenges of engaging with the public and the four party split. "And I think there's no doubt that Rhodri's ability at communication was a strength that meant that he was the person for the job then."